Silver Star Wishes – Musings of stay at home mom and student. Musings of stay at home mom and student. I can’t believe it has actually been a year since I last posted! Since last year in no particular order, I got hired on as an employee at work, we visited Florida (Tampa, Miami, Orlando, Key West) before the craziness happened, I tripped and rolled my left ankle, went to Lake Tahoe before the crazy weather, I fell off a ladder and hurt my right ankle, and I decorated a rose parade float. I think that pretty much catches you up. It’s now spring break for my kids (mine was back in March) and I am trying to think of something to do with my kids. I was thinking of going to the Broad but I may have to wait in line and I don’t know if my cankles can handle that! So it is entirely possible that I just may go to LACMA and I don’t think that I have ever been there despite having lived here for all but 2 years of my life. I’ll let you know what I wind up doing. Maybe I’ll even post pics including some Snapchat ones 😜. We also visited Legoland AND stayed at the Legoland Hotel. More pictures to follow. Another amusement park we visited was More pictures and discussion to follow as well. We’ve actually gone here three times since I last wrote. I also went back to work! So, I can no longer call myself a stay at home mom. This semester, I’ve been taking an evening class and a research class so… my days have been free while my kids were at school. This meant…I was getting bored during the day so I started passively looking for a job. To be truthful, I think I have probably always been passively looking. The job that I found actually turns out to be the job I’ve been trying to get for years. Since the first time I started taking graduate courses in Computer Science! I am actually working in IT!! Hallelujah! So I am happy about it 🙂 Yay! Last Friday, I went to Universal Studios Hollywood…and guess what I got to see first hand!!! It wasn’t an official open but a soft open meaning it’s like a dress rehearsal. I have to say that I was quite impressed. Unlike the other parts of Universal, the cast that works there actually get into character. Many of them wore the capes unless they were playing another part. I bought a Hedwig puppet owl there and the cashier asked me if I wanted to pay with muggle dollars or… I can’t remember what she said for credit. That was my trip in a nutshell! I thought I would keep the generic title of WordPress’ example first post because this is my first post on this website (all the other posts are posts from my old website). It’s 2016 and the post prior to this was actually from 2013 which may look a little confusing because of the way this theme is set up. I’m trying to get up to speed with WordPress themes so that I can create my own theme. Hopefully it will be soon! Be mostly vegan— yes, I’ve already been made fun of because of this but ever since I saw “Forks Over Knives” I was sold on the whole plant based diet. Teach my children gratitude— I think my children are blessed with what they have and I would like for them to KNOW that they are blessed. Learn Laravel or Rails really well. I know bits and pieces but I’d like to be proficient. I’m leaning more towards Laravel because goDaddy does not support ruby. However, I see more job postings for Ruby on Rails programmers. Build a website from scratch. Perhaps using the above knowledge?!?! Come up with a Thesis for my masters in Computer Science. I was thinking of something related to databases. Create a family tradition of game night. We’re hooked on Rummikub but we have a family of 5 and it’s for 4 players! Blog more. What can I say, my last blog post was 3 years ago! Sell my books. I have soo many books in one of our rooms and I want to convert it into a play room. I may apportion part of my website and dedicate it to selling my books. Read more fiction books. Lately all I read are textbooks but I have read a couple books this year. I’d like to read to my children again too. I just heard that Wonder is a great book. Get my kids out playing more rather than indoors on their electronics. Hefty list, I know, but I figure the more you have on your list, the more likely you’ll actually accomplish at least one of the things on your list! My dad died today. Although we weren’t close for over a decade, it still saddens me. I still have good memories of him. I’m glad I got to see you one last time…see you on the other side, Dad. • Noah’s Compass– This was probably one of the most pointless books that I’ve read. Maybe it has something to do with its simplicity but it really lacked plot. • Swamplandia!—This book was a little strange and disturbing. It had paranormal, child molestation, alligators, cancer and indentured worker themes—all of which did not blend well for me. • The Night Circus—This book definitely had potential and had a great story plot but it actually had too many interweaving stories. I will post more about this book later. In an effort to get more book ideas for worthwhile reading, I posted on my company’s Buzz website in the Love to Read group. Unfortunately, I only got one suggestion, but it was a good one– Rules of Civility. 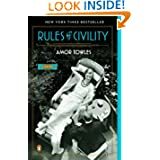 Rules of Civility by Amor Towles was a very interesting read. It certainly was not a quick read but definitely a good read. The book takes place in New York City, close to the end of the depression in 1938. It begins with the chance meeting between working class first generation American, Kate and socialite, Tinker at a bar on New Year’s Eve. The chance meeting brings Kate on an adventurous year moving in the circles of New York’s elite. There were some slow parts to it but otherwise it was good. I like the working class rags to riches story. Without giving anything away, there are a couple twists and unexpected turns in the story that leave you satisfied (or at least me). Go read it. One of my husband’s favorite food nights is taco night. We used to just buy some ground meat (either Turkey or Sirloin) and cook it with a little taco seasoning. We usually serve it on tortillas and have a taco bar of sorts. The bar generally has olives, cheese (the Costco mexican blend), Cholula and home made pico de gallo. Then I visited the Country Cook’s website and I made our taco nights even better! Spray your crockpot with cooking spray. Place frozen chicken at bottom of crockpot (you can use non-frozen chicken but you need to adjust your cooking time). Sprinkle taco seasoning on top of the chicken (put as much or as little as you want but keep in mind the more you put, the more spicy it might be). In a separate bowl, mix together chicken soup and salsa. Pour soup/salsa mix on top of chicken. Cook on low for 6 to 7 hours. Once chicken is ready, shred chicken in the pot or if you prefer not to mark up your crock pot you can take out the chicken before you shred it (and then put it back in). Serve on your favorite kind of tortilla and create your taco bar. Yummo! You can imagine my delight when I found this on Pinterest. It’s from one of my favorite sites…Six Sisters’ Stuff. It’s a simple recipe and you can adapt it in different ways. The first Time I made it, I think I over baked it but it was still delicious. You have to remember that even though you take it out of the oven, it still cooks afterwards, so it is good to take it out early. I actually have a convection oven so, mine bake even FASTER. So bake it a few times and adapt it to YOUR particular oven. In my oven, 16 minutes was perfect–I like it moist. Combine the cake mix, oil, and egg in a large bowl. Add the milk slowly. Then mix in the rainbow sprinkles and white chocolate chips. Spray pan or Pyrex baking dish with non-stick cooking spray. Pour batter (the batter is kind of doughy, so it’s not like normal cake batter) in pan and spread to the edges. Bake for 16 – 20 minutes at 350 degrees. While the cake is cooling, make the frosting. Frost when cooled and sprinkle with sprinkles (my girls’ love doing the sprinkling as you can see in the picture below). 3-4 drops food coloring to match what ever occasion you may be celebrating. Combine all ingredients until well-blended. Spread on top of blondies. For the Fourth of July, I made it with a box of patriotic cake mix. I put half of the red and blue sprinkles in the cake and saved the remainder for the top. All Recipe — a great place to pick from thousands of recipes and try them! With this site, there are so many recipes that you have to subscribe to multiple feeds. It’s helpful to read the ratings and the comments (people often make modifications and comment on the result). Andrea Meyers— I especially like the Kids Cook posts. These kid posts are kid friendly and give you tips on how to show the kids to cook the particular recipe. Baker Lady –She is the originator of the Peanut Butter Bars. Budget Bites – This blogger actually shows you the cost of the recipe, which in this day and age of expensive food– is pretty cool. Cake Wrecks -This site isn’t an inspiration. It’s actually cakes that have gone bad. I am strangely fascinated with this blog. Real Mom Kitchen -She also has a kids cooking series of posts. Serious Eats – Sometimes these are just about food trucks or restaurants. But they do post recipes or recipe links that are REALLY good. Six Sisters – I have to say, that this is one of the best sites EVER. Especially for a mom like me. I’d love to one day make it onto their link party posts. Slow Cooker from Scratch – This site is also Kalyn. I love using my slow cooker because now that I work, it is so much more convenient to prep and let it cook while I work. Soup Chick – I LOVE soup. It’s a lot, I know. You can see why I get overwhelmed. I actually subscribe to more, but these are my favorite. Enjoy!! My day to day thoughts (or more likely week to week).